2. Heat the oven to 180°C, gas mark 4. On a lightly floured surface, roll out half the dough to the thickness of a pound coin. Using a 7.5cm cutter, stamp out 12 circles. Using a small cutter (try a 2cm circle or a heart or star shape), stamp out the centre of each biscuit. Place on a large, lined baking sheet. 4. 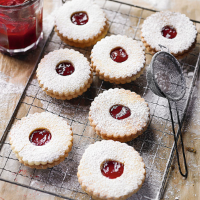 Place a large teaspoonful of jam in the centre of the base biscuits and spread out a little. Press on the top biscuits and dust with a little more icing sugar, to serve.